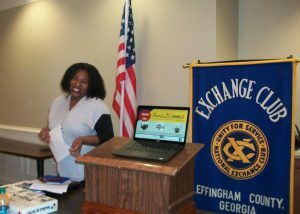 At their April meeting, the Exchange Club of Effingham Co. hosted Destiny Bradshaw, Director of Ready2CONNECT. She spoke about the history and impact that Ready2CONNECT has had in the Effingham County community. The mission of Ready2CONNECT, powered by action pact, is to empower families to achieve career and family success by providing self-development programs, access to community resources and community partnerships that promote educational, emotional and financial wellness. The organization helps with career readiness, financial and emotional empowerment, GED prep and literacy. More information can be found at www.myactionpact.org.